Ever wanted to check how you're looking on the go? 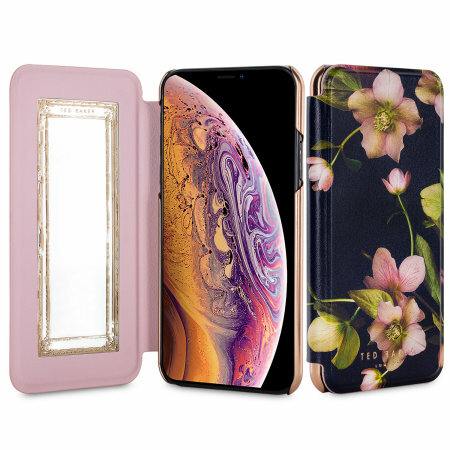 With the Ted Baker Mirror Folio case for iPhone XS Max, you can do just that thanks to a concealed mirror on the inside of the case's flip cover. This slimline case also offers excellent protection. Came on time, good quality, sleek and beautiful. This phone case is beautiful! I had several people pick it up and exclaim over it on the first day I took it to work. The colours are lovely and the case is sturdy. Perfect blend of practical and beautiful! Phone case is lovely and just what I was looking for, cute design (love the mirror and had loads of compliments) and protects the phone well (I’ve already dropped it a few times with the case on and no damage done). Feels expensive. Prompt delivery as well, I would buy from this company again if I ever needed another phone case. Very smart and does the job! Perfect case enough to show off!! Best iphone case I’ve ever purchased! Excellent customer service. My ted baker phone case is gorgeous. This case exceeded my expectations in every way it was so difficult to find one I ordered It arrived on time and I love ???? This was my first purchase with a folio case and I am very satisfied. The graphics alone on the outer case is beautiful art to look at. I was easily able to put a glass screen protector on my phone then place into the case with no problems. The case is very sturdy and stays aligned in place and doesn’t slide due to the great magnetic clip. I’ve already dropped my phone a few times since I’ve had this case. No wear and tear observed. The case looks as new as the day I received it. Looks amazing on my phone thank u !